Planet Natural offers a large selection of bins and tumblers designed for home and garden use that are practical, functional and efficient. Composting at its most basic. Made of recycled black plastic, so there’s nothing to rot or rust. Best For: Growers with limited space. 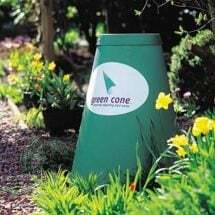 Neat appearance and low cost make this the most popular composter available. Ideal for kitchen scraps and a limited amount of yard waste (11cf). Advantages: Low maintenance, for example, you don’t have to turn a holding unit. Lid keeps rain off the contents and helps deter animals. Black color absorbs heat – enhancing the decomposition process. Downsides: Low maintenance means the process can take longer. 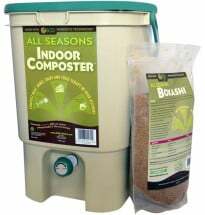 Composting can take from six months to one year using this kind of container. Decomposition can occur quickly if aerated. Purchase a kitchen pail or crock from Planet Natural and there’s no need to run out to the pile after each meal – just lift the lid and toss-in table scraps. They’re fitted with activated carbon filters to eliminate odors and look great too! As the name implies, a rolling bin can be rolled to your yard waste, loaded up and then rolled away. A quick tumble every day or two mixes and aerates the pile, eliminating the need to aerate with a pitchfork or aerating tool. Best For: Homeowners and others with sufficient space. Eliminates unsightly refuse piles and can be rolled out of sight when not in use. 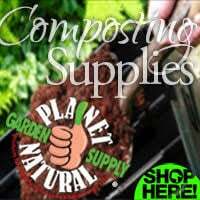 Use to recycle yard clippings and vegetable scraps. 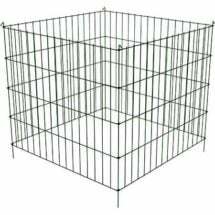 Ideal for an average sized yard or garden (13.5cf). Advantages: Low maintenance, plus they make aerating the pile easy. Lid keeps rain off the contents and helps deter animals. Made of recycled plastic and easy to assemble. The spherical shape maximizes heat retention for faster decomposition. Downsides: Fully loaded bins can become heavy and difficult to roll. The perfect size if you accumulate less than 2 trash bags of material every month. One notch up on the evolutionary scale from the spherical and enclosed bins, compost tumblers are designed so that they turn their contents easily. A household size composter for daily amounts of kitchen and household throwouts — finished compost in 4-6 weeks! 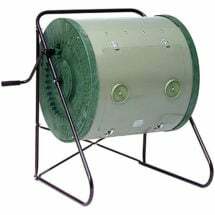 The Back Porch ComposTumbler is great for your deck, porch, right outside your kitchen door or next to your recycling bin. Best For: Homeowners with limited space that are willing to invest in a tumbling system. Neat appearance and quick composting times make these units a popular choice. Advantages: Energy-efficient design is relatively easy to aerate. Supplies bacteria with the oxygen it needs and consequently speeds up decomposition. Available in various sizes, small to large. Lid keeps rain off the contents and helps deter animals. Drums usually sit off the ground — less bending! Downsides: Once these units are full and the decomposition process begins, you have to wait before adding additional materials. With the right composting equipment turning table scraps into valuable vermicompost is a cinch! Planet Natural supplies everything you need to get started: worms, a container and “”bedding.” Plus books that tell you just how to do it. Now let’s rot! Using redworms to compost is a convenient way to dispose of kitchen scraps and turns them into a rich, organic soil conditioner known as worm castings. If you supply the right ingredients and care, your worms will thrive! As seen on The Martha Stewart Show! 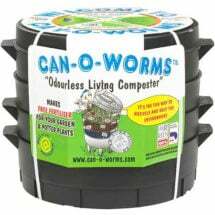 The Can O Worms provides a quick, odorless and space efficient way to convert kitchen scraps into rich, crumbly vermicompost. Contains 3 large capacity working trays — no need to purchase additional trays! Best For: Homeowners and apartment dwellers with limited space. Use to convert kitchen scraps into rich, crumbly castings and worm tea, a nutrient-rich liquid fertilizer. 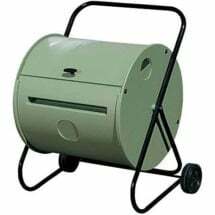 Advantages: Worm bins can be located anywhere from under the kitchen sink to outdoors or in your garage. Once up and running they require very little maintenance. Stacking tray design allows the worms to “eat their way up” to their food, leaving their nutrient dense castings behind. Downsides: Temperatures need to be considered. 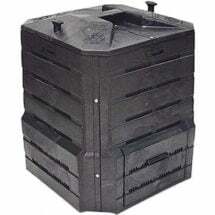 Ideally a worm bin should be located in an area where the temperatures are between 40-80˚F. In cold climates, bring your bin inside during the winter to avoid freezing. In hot climates, keep it wet and cool. On occasion, unpleasant odors may waft from the container when it’s overloaded with table scraps. If this occurs, stop adding food until the redworms have had a chance to break down what is left in the bin. The lazy man’s entrée into composting. If you don’t want to build or purchase a bin, simply start heaping your organic materials in a corner of the yard. Best For: People with adequate outdoor space and who are willing to invest time — if not in building a bin — then in turning their heap or pile. Downsides: If not properly aerated, heaps can take a long time to decompose. 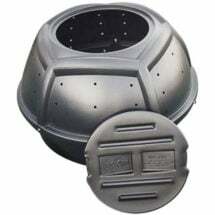 Since they are not enclosed, they can also attract pests if you’re not careful. Click on Step-By-Step Instructions to Build a Compost Pile for more information. Uses shallow pits dug in the ground as opposed to above-ground structures. The pit should be no less than 18 inched deep, 3 feet wide and any length. This method produces high temperatures and relatively quick decomposition. Best For: People who want to contain and shelter the compost pile. Minimal investment is required, except for time. Downsides: Requires regular maintenance or anaerobic conditions can take over quickly due to poor ventilation. Only small amounts of organic waste can be used at one time. Learn more about pit composting here. Best For: People with large gardens who aren’t afraid to experiment. Downsides: Using your garden as your “bin” means tying up the nitrogen which your plants normally would use. That means you have to do this in the fall when your garden is fallow. 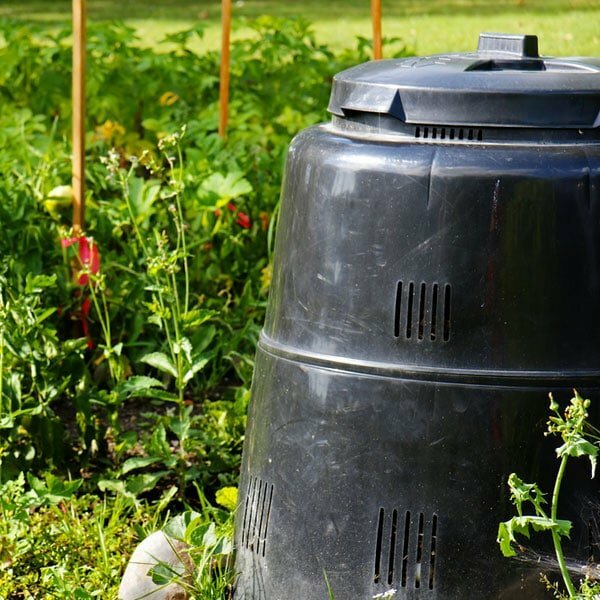 Visit the University of Illinois Extension for more about the benefits and concerns of sheet composting.